For the philosopher Chantal Mouffe, whose ideas inspired La France Insoumise [France Unbowed], Macron embodies the supreme stage of neoliberal post-politics: which is why opposition is possible only on the streets. A professor at the University of Westminster in London, the Belgian philosopher has theorized ‘left-wing populism’, a key concept for understanding the evolution of the radical left. She advocates a conflictual vision of democracy. 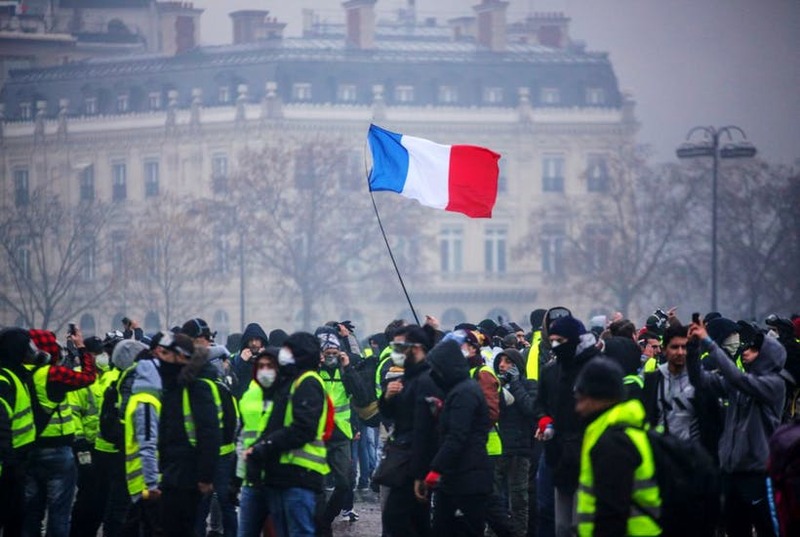 Is the gilets jaunes movement a populism? We are clearly in a populist situation. By populist, I mean the establishment of a political dividing line between ‘those below’, ‘we’, the people, and ‘those above’, the ‘caste’. This construction of a new divide is the result of the emergence of a whole series of resistances to thirty years of neoliberal hegemony that have established a post-democracy. This post-democracy era is characterized by a crisis of political representation and a crisis of the neoliberal economic system. Above all, citizens feel that they have no real choice between the political options on offer, they no longer see a difference between centre-right and centre-left. And they wonder why they should go and vote. This is a fundamental movement common to all of Western Europe. It is what I call the ‘illusion of consensus’: people feel forgotten, they want to be listened to. One of the slogans of the indignados in Spain was: ‘We have a vote, but we have no voice.’ It is a reaction to the ‘oligarchization’ of society, characterized by the explosion of economic inequalities between a group of super-rich and the middle class. Why do the gilets jaunes focus on Macron? This movement cannot have a long-term solution without a profound transformation. However, Emmanuel Macron’s aim is to strengthen the neoliberal policies that have led to the current protest. He believes France’s problem is that it has not gone far enough in these reforms, particularly in reducing the welfare state in line with Tony Blair’s ‘third way’ policy in England. Macron is the supreme stage of this post-politics. Not only was his election a bad business. In addition, he managed to neutralize the National Assembly by winning an overwhelming majority of deputies, making the work of its members obsolete. In fact, the government’s policy can only now be opposed in the street. What kind of political movement might the gilets jaunes lead on to? This anti-political form can be articulated in the direction of a right-wing populism or a left-wing populism. I would like to believe that the current turn of events opens up prospects for a left-wing populist political movement. The fact that anti-racist collectives such as the Adama and Rosa Parks committees mingled with demonstrators arriving in Paris from the provinces last Saturday is a step in this direction. It shows that there is already a junction between the rural France that initiated the movement, and the working-class districts. They understood that they had common interests. The whole question is how these claims will be articulated. What is missing for these first signs of revolt to materialize politically? This is the whole idea of François Ruffin, who wants to ally the intellectual petty bourgeoisie – in a nutshell, the people of Nuit debout – with the gilets jaunes. If these two components fail to join together with feminist, anti-racist and working-class demands, the possibilities of politically building a left-wing people will be very limited. Should the gilets jaunes be organized around a leader? Not necessarily. Even though I believe a leader, at least a symbolic one, can manage to crystallize the emotions expressed in social anger. Has there ever been a major political movement without a leader? Their role could help mobilize collective passions. Because the gilets jaunes movement reminds us how important emotions are in politics. Something that technocrats have totally forgotten. Can we compare it with the Five Stars Movement in Italy? The fuzzy and horizontal nature of the movement, with Macron as its only enemy, recalls the origins of the Five Stars Movement. Like the Italian example, it is neither right nor left, and is currently taking a heterogeneous and anti-political form. It is a rejection of everything to do with political parties and representing the establishment. If the gilets jaunes movement does not find an institutional political form, it may quite possibly take a dangerous turn. That’s what happened with Five Stars. Since joining the government, the movement has adopted a right-wing stance. This is an issue that will confront the gilets jaunes movement if it continues.